In an interview with FORA.tv called Creativity in the 21st Century, Apple co-founder and entrepreneur Steve Wozniak recalls an interesting moment in Apple's history: the day when he came up with the idea to put color in a personal computer during a four-day and four-night coding / design session for Atari's Breakout game. "Putting color in the computer was probably one of the biggest things Apple ever did", he says. "Nobody expected color to come into a computer because color machines cost a thousand dollars." "I figured out a way to do it with one little $1 chip". The Woz explains in those days he was tired, really tired, and his mind was in a "floating half-asleep state" due to the lack of sleep and too much work. He saw the technique Atari used to simulate colors on its first arcade games, and he thought it would be great to find a way to do real colors with pixels through a chip on a personal computer. Color on the Apple II series took advantage of a quirk of the NTSC television signal standard, which made color display relatively easy and inexpensive to implement. The original NTSC television signal specification was black-and-white. Color was tacked on later by adding a 3.58-MHz subcarrier signal that was partially ignored by B&W TV sets. Color is encoded based on the phase of this signal in relation to a reference color burst signal. The result is that the position, size, and intensity of a series of pulses define color information. These pulses can translate into pixels on the computer screen. 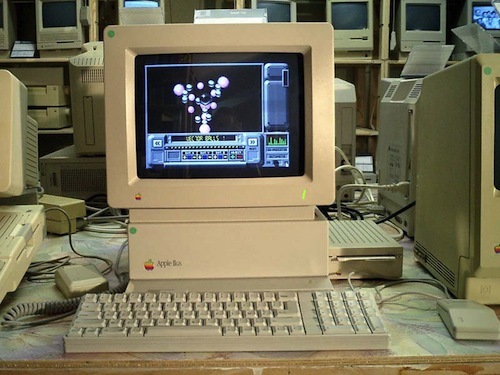 The Apple II display provided two pixels per subcarrier cycle. When the color burst reference signal was turned on and the computer attached to a color display, it could display green by showing one alternating pattern of pixels, magenta with an opposite pattern of alternating pixels, and white by placing two pixels next to each other. Later, blue and orange became available by tweaking the offset of the pixels by half a pixel-width in relation to the colorburst signal. The high-resolution display offered more colors simply by compressing more, narrower pixels into each subcarrier cycle. The coarse, low-resolution graphics display mode worked differently, as it could output a short burst of high-frequency signal per pixel to offer more color options. Listen to the whole story of how color came to be into Apple's computer below. A few years later, Steve Jobs experienced his first TV interview.